Days of Our Lives spoilers reveal Abigail Deveraux (Kate Mansi) soon pretends to be Gabby, resulting in Stefan DiMera (Tyler Christopher) getting her released from Bayview. Abby fakes being her alter Gabby so that she can make Gabi Hernandez (Camila Banus) pay for gaslighting her. Will Stefan learn the truth that Abby is playing him? 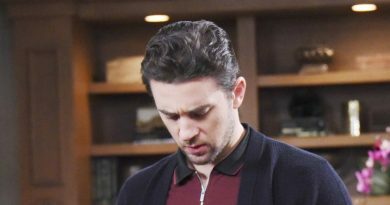 What will Chad DiMera (Billy Flynn) think? On Days of Our Lives, once Abigail Deveraux found herself forcibly committed to a mental hospital, she knew she must get out. Gabi visiting her in the hospital and taunting her, revealing that she, in fact, had been gaslighting her all along, just made matters worse. But Abby knows that she can’t get free without a little help. And sadly, her love (and ex-husband) Chad DiMera won’t help her get out. So, that leaves her with only one choice: Stefan, her current husband, whom she married to keep her out of the hospital. However, her plan didn’t work on Days of Our Lives. Unfortunately, Stefan DiMera worked with Chad to get her committed. Abigail Deveraux couldn’t believe the betrayal from Chad, nor could she believe that Stefan so readily went along with it when they concocted their own plan together when she married him. But Chad offered Stefan the baby, and that’s all it took. Abigail, therefore, has only one thing she can do. Days of Our Lives spoilers revealed that she pretends to be Gabby – her alter that was in love with Stefan – to make him get her out of Bayview. And her plan works wonders, as that’s exactly what Stefan DiMera does. However, Gabby isn’t really back. None of Abigail’s alters are back. She’s healthy, sane, and wrongly accused of being sick. But Stefan, who’s madly in love with Gabby, believes his love is back to him and can’t hear anything else. But how long will this last? 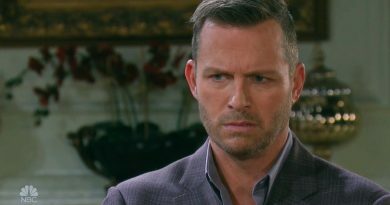 Days of Our Lives spoilers wonder now that Stefan DiMera takes Abby from Bayview, how long will Abigail pretend to be her alter? Will Stefan notice something with his love is amiss? Or is he so obsessed with Gabby that he refuses to believe in anything else? No doubt, Chad won’t like Stefan’s change of heart, nor is he going to like seeing “Gabby”. Days of Our Lives Spoilers: Will Abigail Reveal Gabi’s Scheme? Will Abigail break down and let Chad in on her little secret? Or will she continue the charade in front of everyone, including her family? Days of Our Lives spoilers previously revealed that Chad and Abby will reunite but it could take a while to trust each other again. Abigail wants out of Bayveiw because she’s not unstable and wants to take care of her son and newborn daughter. But, she also really wants to make Gabi pay. Abby always suspected Gabi was behind everything. Gabi’s gaslighting confession prompted furious Abigail to attack. However, Chad walked in and took it as another sign that Abby needed help. Now that Abigail Deveraux is out free from Bayview, she can work to take down Gabi once and for all. Will she succeed? Or will Gabi get out of this one, just like she always does on Days of our Lives? As always, make sure to head back to Soap Dirt daily for all the latest Days of Our Lives spoilers and news. ‘Days of Our Lives’ Spoilers: Stefan Faces Chad’s Wrath Again!